1. Contract. A performance agreement (contract) that includes the guaranteed wage agreed upon and the details of the event is generated. This contract is E-mailed to my client for review and for an electronic signature. I also sign the contract. 2. Reservation Deposit . A required reservation deposit amount will be determined based on the quote. *A signed agreement AND reservation deposit are required for the guaranteed reservation of services. Please call us to confirm that we received your information. - Exact Start time and duration time of services. Q: What kind of events do your provide Spanish guitar services for? A: I provide Spanish guitar music for every kinds of event. My services are perfect for wedding ceremonies, cocktail hours, dinner receptions, birthday parties, anniversaries, memorial services, Sweet sixteens, corporate events and much more! Q: What type of instrumentation can be hired? A: I can either provided "Solo" guitar (no accompanying musician) Or I can provide "Solo" guitar with an accompanying musician, usually a percussionist, who accompanies me with congas, bongos, cajon drum, and other percussion instruments. Q: What is one of the most popular service(s) and why? A: The most popular "Live" musical services are either my solo spanish guitar, Duo (with my accompanying musician) and the package of Live guitar music and professional DJ services. 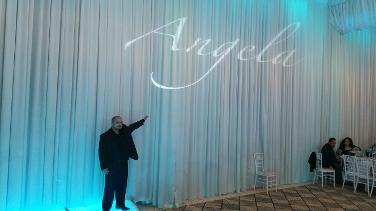 Many of my clients also add on other services as seen on my site "uplighting", "monogram" services. Q: What are some of the locations/cities that you can provide services? San Fernando Valley, Orange county, Beverly Hills, etc... However, I do also travel out of state. A: I typically wear all black; black collar shirt, coat, and slacks. Q: What time do your arrive for an event? A: If I am providing guitar music for a wedding or event, I typically arrive 1-2 hours prior to the scheduled start time for set up and sound check. When providing Spanish guitar and professional DJ services or any other additional services, I arrive anywhere from 3-5 hours prior to the scheduled start time for set up/sound check, and to go over any details with my clients, the venue coordinator, and or event planner. Early arrival is of upmost importance. Q: Do provide audio for an outdoor event/wedding? A: Yes. This is included in services. I use a compact professional sound system for my guitar and I also set up a microphone for my clients for any announcements that need to be made or for their wedding vows. Q: What time do you usually arrive to an event for set up? A: It varies: If performing “Live music”, we arrive at least 1-2 hour prior to start time. For “Live music” AND “DJ services”, we arrive approx 3-5hours prior to scheduled start time for set up. Q: Do you have multiple audio set ups? A: Yes: We have separate audio set-ups, ready to go for each transition of Entertainment. Example: One set-up for Live Entertainment and another for DJ services. A: Very little space is required for Live music services. For DJ services a little more space is required, as there is more audio gear: multiple audio units, a DJ table, lights etc.. 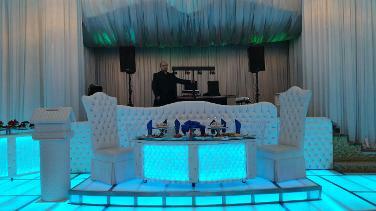 Overall, our set- up is very compact, clean and professional. Q: What types of events do you provide services to? A: All types of events: Weddings, Sweet Sixteenths, Anniversaries, Corporate events/Private events, Memorials services, Engagement parties, Holiday parties, and much more! A: Yes, A formal contract that includes all details to an event: Date, location of venue, Start and end time, guaranteed wage agreed upon, contact information, is generated and sent to our clients for review. Q: Do you take clients requests to learn a specific wedding song that is not on your song list of Live guitar music? A: Yes. However, it does take a while to sit and learn a song and other commitments might not allow this. The earlier the booking is done, the better chances are that time will permit to learn a specific guitar song. It is not guaranteed, as other commitments may not allow time, but every effort will be made. Q: Do you have a “Live” music song list for when you play for a ceremony/cocktail hour? A: Yes. (Scroll down to the bottom of this page). I do play some of the traditional wedding songs on my guitar and more contemporary non-tradiotnal wedding songs. However, they are all appropriate for a wedding ceremony. For example, I can interpret a pop song, rock song, R&B song very elegantly by adding my own spanish/classical guitar style. Q: What accommodations do you require when providing Live spanish guitar for a wedding and event? A: In only require a minimum of two power outlets/power sources to connect my power chords/power strips. More electrical outlets are required when providing DJ services and lighting services. Q: Do you provide guitar music for beach weddings? A. Yes, I provide guitar music for beach weddings and I also provide musical services at other locations such as memorial parks, parks, hills, and even deserts. Q: What if there are no electrical outlets/power sources? at an outdoor event such as a wedding. A: Yes. A small reservation deposit is required in order to hold the date. This deposit basically "black outs" the date and guarantees that it's reserved to you. When the deposit AND contract are received, the date is officially booked to the client. A: Cash, Cashiers check, Money order, personal check, Credit card. (A merchant fee is added to credit card payments). A: Professional DJ services, Audio rentals, uplighting/ambient lighting rental installation, and gobo/monogram projector rentals, and video/screen projector rentals. A: Pricing is determined on a few factors: Nature of event (wedding, sweet 16, anniversary, birthday, corporate event, memorial service etc..), Date, Location (distance we must travel to an from the venue), configuration of Entertainment (Solo guitar, Duo, Trio, DJ services), and duration of services. We do provide a package discounted deal for booking Live Entertainment with DJ services or adding on other services such as "uplighting" or "monogram/gobo design" services. Live Spanish guitar music songlist. These songs are interpreted with the "Spanish/Classical/Flamenco/Latin/Pop" flare, as in some of the video samples on my site. Some are traditional wedding songs and some are contemporary songs. However, they are all appropriate for a ceremony, cocktail hour, and reception.